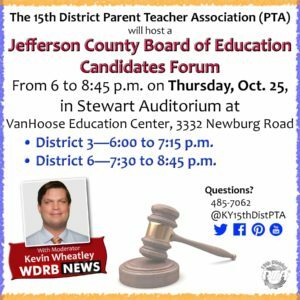 Candidates Forum – Click here for a flier that you can send home. This is very important legislation that will affect every student in Jefferson County and across the Commonwealth. If we do not take action as parents and families then we will lose one of our only voices in our children’s education. 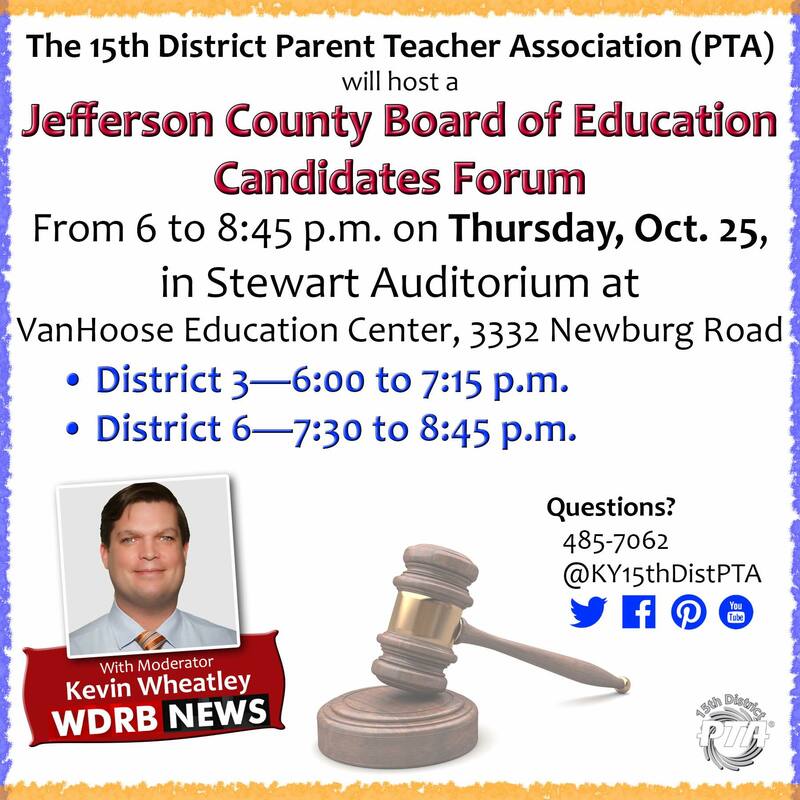 The 2017 Kentucky Legislature will make important decisions about the future of school councils. The first challenge is already here: Senator John Schickel of Boone County has filed a bill (BR 426) that would give superintendents powers that currently belong to councils. power to decide student support services. For three weeks the Kentucky PTA is sending its members messages regarding the Governor’s proposed education budget cuts. Each week we will focus on a different program that if cut will directly affect our students’ education. Here is a template letter for the third week’s budget focus: Flexible Funding. We are asking that you send this letter to your Senate or House Representative. Feel free to add your own personal experience with each program and more information about how you feel it benefits the state and our children. If you do ask for a response, please make sure to include your email address, phone number, address and/or other contact information. Please share any responses you receive from legislators with Sharon Whitworth, Kentucky PTA Legislative Commissioner at swhitwo1@aol.com . It is vital that we reach out to our legislators at this crucial time. We appreciate all that you do for the children of Kentucky. For the next three weeks we will be sending you messages regarding the Governor’s proposed education budget cuts. Each week we will focus on a different program that if cut will directly affect our students’ education. Here is a template letter for the first week’s budget cut: Funding for FRYSCs. We are asking that you send this letter to your Senator and House Representative. It is vital that we reach out to our legislatures at this crucial time. We appreciate all that you do for the children of Kentucky. KEAT supports increased funding for all P-12 public school students as an urgent priority for the Commonwealth. 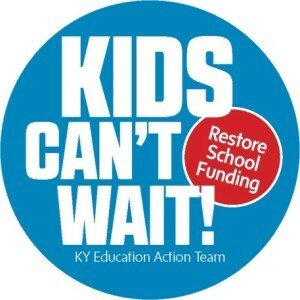 While KEAT supports more funding for all school programs, we specifically support increases to address three critical needs in the 2016 Kentucky General Assembly. Adopt a funding plan for the Kentucky Teachers’ Retirement System. A sound pension system helps recruit and retain quality teachers. KEAT urges the governor and legislature to enact a plan that will assure adequate funding for KTRS to eliminate its current accumulated unfunded liability within the next thirty years. The single largest strain on Kentucky’s budget is this obligation to current teachers and retirees. Kentucky teachers do not participate in Social Security so their KTRS benefits are their only economic safety net. Provide more children with high quality early education. High quality early childhood education is critical to a child’s success in school and in life. Such programs reduce achievement gaps and increase graduation rates, leveling the playing field for all our children. They help assure that Kentucky will have an educated workforce. Increasing the eligibility for public funding for preschool services to families whose income is at or below 200% of the federal poverty level will expand these services to 15,000 more four-year olds. Assure safe transportation to and from school for our students. As student transportation costs have continued to increase, funding has not. Aging buses and additional demands for bus safety increase needs. School districts have diverted general state and local school funding to safely transport students. The state currently reimburses less than 60% of the cost of student transportation, in a program designed to reimburse the full cost. If the state provides more funding, diverted state and local funds can be redirected to other pressing student needs. An adequately funded teacher pension system benefits students, local communities, and the Commonwealth. The promise of a good pension helps us recruit and retain quality teachers. Each community benefits from the contributions of retired teachers, as they spend their pensions and their volunteer energies locally. With an accumulated unfunded liability of approximately $14 billion and a funded status of 55.3%, resources required to meet the Commonwealth’s obligations to current and retired teachers place a significant strain on the state budget. The lack of a plan to address KTRS’ funded status makes meeting other budget priorities much more challenging. It also decreases the state’s credit rating. High quality preschool for our at-risk children is characterized by developmentally appropriate curriculum and high standards for teaching, health and safety. Such early education provides a solution for our persistent gap issues. Research clearly shows that our best return on investment is during the early years, birth through age five. The cost of later remediation and incarceration far exceeds intervening early. Collaboration among schools and child care providers can accommodate expanding enrollment and provide children and parents with a full-day, year-round program. As a result, more children will be ready for kindergarten and success throughout school and life. As fuel, driver pay, bus purchases, insurance, repairs and other costs have increased, the state’s reimbursement for student transportation has stayed flat, reducing the funding level well below 100%. Pupil transportation, as a component of the SEEK formula, was designed be fully funded by the state. As state transportation funding as a proportion of the total cost has declined, school districts have been forced to divert other state and local funds to assure that students are safely transported to and from school. Locate and contact your legislators. Print and sign This Letter to Legislators or write your own and deliver it to the 15th District PTA Office by 2:00 pm Jan. 13. We will hand deliver the letters to Frankfort on Jan. 14 during Children’s Advocacy Day. Explain the importance of funding education to friends, neighbors, family members, coworkers, and have them call their legislators, as well. Share this post via email and on social media (links are below).